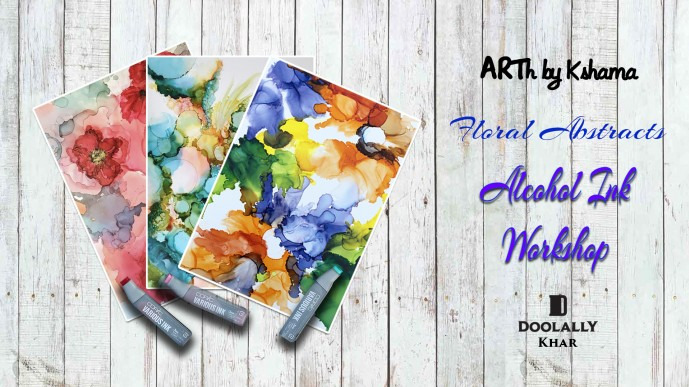 ARTh by Kshama presents Floral Abstracts -Alcohol Inks Workshop. Alcohol ink is an impressionistic medium. This medium is a current rage amongst artist due to its highly pigmented colors that are transparent and extremely vibrant that dry giving a polished stone effect. Alcohol inks are widely used to create flowing abstract art, for mixed media projects, coasters (petri dish) etc. They can be used on multiple non porous surfaces like glossy paper, metal, glass, ceramic etc. In this workshop we shall run through the various techniques of painting with alcohol inks and create our own floral abstracts on yupo paper (special papers for alcohol ink paintings). Share "Floral Abstracts- Alcohol Inks Workshop"